CTET 2019 Syllabus, Exam Pattern, Qualifying Marks and validity of certificate : The CTET examination is scheduled to be conducted on July 7, 2019. The CTET shall apply to schools of the central government (KVS, NVS, Central Tibetan Schools, etc.) and schools under the administrative control of all the UTs. The validity period of CTET qualifying certificate is for seven years from the date of declaration of its result. The candidates who have applied for the exam can visit the official website to check the latest update on CTET 2019. Multiple Choice Questions (MCQs) will be asked and four alternatives will be provided to the candidates. There will be no negative marking. Paper 1: For those who want to teach Class 1 to 5. Paper 2: For those who want to teach Class 6 to 8. Those who want to teach at both the levels will have to appear for both these papers. The candidates need to follow NCERT books as the questions will be based on syllabus for classes 1 to 5. However, the difficulty standard as well as linkages, could be up to the secondary stage. The main question paper will be Bilingual (Hindi/English). A person who scores 60 per cent or more in the exam will be considered as TET pass. Those belonging to SC/ST/OBC/differently abled category will be provided relaxation up to 5 per cent in the qualifying marks in the minimum educational qualification. 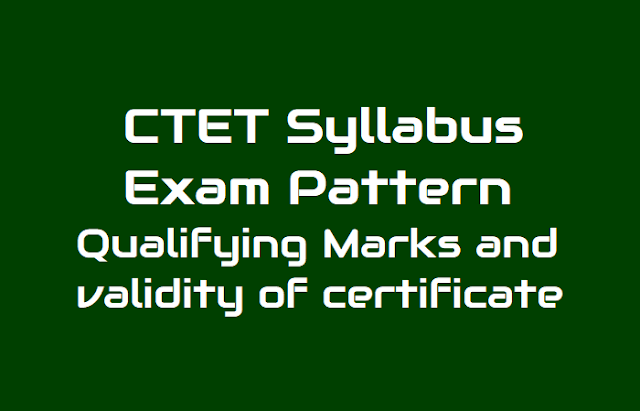 The validity of CTET qualifying certificate will be seven years from the date of declaration of its result. Learning and Pedagogy (Questions- 10) . It is advised that candidates need to follow NCERT books as the questions will be based on syllabus for classes 1 to 5. CTET Paper I is for Classes 1 to 5 or Primary Stage. The paper would consist of 30 questions from child development and pedagogy, 30 questions from Language 1 and 30 for language 2. Mathematics and EVS would have 30 questions each. The further break up and content for Paper I sections is provided below. Child Development and Pedagogy would have three sections. 15 questions would be from Child Development (Primary School Child), 5 questions from ‘Concept of Inclusive education and understanding children with special needs’ and 10 questions from learning and pedagogy. Addressing the needs of children with learning difficulties, ‘impairment’etc. Section 2 and 3 would be language I and II. There would be a total of 30 questions of which 15 questions would be on language comprehension with unseen passages. The passages would have one prose or drama. 15 questions would be from pedagogy of language development. Pedagogy includes topics like principles of language teaching, learning and acquisition, Challenges of teaching language in a diverse classroom; language difficulties, errors and disorders, language skills, etc. These two sections would have 30 questions each out of which, 15 questions would be based on content and 15 from pedagogy. The content for Mathematics would include the syllabus/ curriculum till secondary school level including Geometry, Shapes & Spatial Understanding, Solids around Us, Numbers, Addition and Subtraction, Multiplication, Division, Measurement, Weight, Time, Volume, Data Handling, Patterns and Money. For EVS, the content would include Family and Friends, Food, Shelter, Water, Travel and Things We Make and Do.